Interesting and useful places near the metro stations. We have several types of apartments from small tiny studios up to spacious elegant three- bedroom apartments in some of the Kiev's finest locations. Please contact us about possible discounts. All apartments can be booked via internet or by telephone. This service is available 24 hours per day. Please, make your reservation in advance. Subway station in 5 minutes. Experience living in one of the best our apartments with the perfect location and amazing panoramic view from windows. It is hard to find such combination of the quality, the downtown place and the nice view. 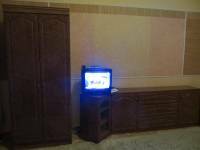 This Apartment is supplied with LCD TV set in living-room and one more independent TV system in bedroom with satellite and cable channels. Besides king-size double-bed there are two sofas so up to 3 people can sleep separately. Wooden floors and high ceilings as usual as in Kiev center buildings. Microwave oven, washing machine and even trainer machine are at your disposal. 7th floor with elevator, bedroom 22 sq.m. living-room 20 sq.m. Cable and Satellite TV, CD Player, telephone, washing-machine, full kitchen. Malaya Zhitomirskaya is one of the streets wich bind central square of Kiev (Independence Sq) with Mikhalivska and Sofiivska squares. This is the very heart of old Kiev. Also this place has easy access to walking area of city park (Volodymirska Girka) and Metro line. The luxurious hotels in Kiev (Intercontinental and Hyatt) are nearby. Total renovation and restyling were conducted at this apartment to create modern and comfortable living place. This apartment corresponds to luxury hotel suite but with own cooking possibility and washing machine and assigned for short-term rental or long term stays as well. This accommodation is located on the second floor of historical empire style building of 19th century. The building has secure entrance and elevator. Worth a mention that our office is located here as well but on the ground floor. The same staircase is occupied with other our apartments (sinle-room). Apartment is located on the sixth floor in nine-storey building of recent construction with lift. Despite being in the very center of Kiev, this place is calm and tranquil, surrounded by green trees and vegetations. Street entrance is protected by security lock. This flat has roomy neat seating area in the living room with stylish furniture and big soft carpet decorated in "Dalmatian" style, spacious bedroom with king-size double-bed, nice ready-to-cook kitchen designed for comfort and functionality, modern bathroom with shower. This accommodation also comes with air conditioner and water heater installed. Need to mention there is no washing machine in apartment but we offer laundry service free of charge and round-the-clock for all guests living here. Apartment's hallway is supplied with spacious built-in wardrobe. Big balcony facing Malaya Zhytomyrskaya street and Maydan Nezalezhnosti at your disposal as well. TV is connected to the city cable system and includes more than a hundred of TV channels in different languages. Free and unlimited High Speed Internet access either via WiFi or by plugging your computer directly into the Ethernet port. All mentioned features are making this apartment an excellent alternative to a hotel for your short break in Kiev. All kitchen appliances for meals cooking, cuttery, cookware, dishes, glassware, etc. This apartment is located on one of those narrow historical radial streets connecting urban central square of Kiev (Majdan) with ancient Mykhailivska and Sofiivska squares famous to St.Sophia and St.Mikhael churches built a thousand years ago. It is about 50 meters walking to Majdan Nezalezhnosti with Metro station entrance of the same name. This location is preferable for tourists and all people coming to Kiev for any purpose so far as it has easy access to main street of Kiev Kreshchatyk with shopping and entertainmet area, lies close to major city sights and historic area and within a couple of minutes from amazing park Volodymyrska Hirka, beloved by kyivites. Inspite of such central location you will be hidden from the usual city noise. Also you will find a lot of small restaurants and pubs nearby. One of the best and recommended Kiev pubs - Irish O'Briens is situated in the same block. Also you can experience russian bania - traditional slavic steam baths wich are very popular in Ukraine, one of them is located just in front of your building. Subway station in 4 minutes. This apartment is located on the fourth floor of historical building facing Maydan - the central square of Kiev. Street entrance is combined with small street cafe, the building has a lift also. Apartment consists of two separate rooms and bathroom.We conducted renovation here recently and succeeded to create space and quiet flat, comfortable for accommodation. Floors are covered by wooden parquet, soft carpets, new joinery, modern furniture and all necessary home technique are intended to make your accommodation comfortable and relaxing. Bedroom comes with a big double-bed and huge wardrobe, living-room has transforming leather sofa, both rooms are supplied with air conditioners and LCD TV sets. Ready-to-cook kitchen will let you to avoid high prices in restaurants. Also there is a balcony looking over central square of Kiev with stunning view especially at night. Bathroom comes with nice long-bath and shower, there is a washing machine and floor-warming system. This apartment has broadband internet with Wi-Fi, cable and satellite TV. Perfect place for short-term stays or prolonged living. One of the best that we offer to our guests. Car parking is possible near the building on guarded or free of charge place. Set in an impressive place overlooking the Maydan this modern and spacious apartment offers calm and comfortable furnishings. You will have a small coffee-bar on the first floor of the building, facing the central square of Kiev and all three Kiev's Metro lines nearby: the nearest Metro station is "Maydan Nezalezhnosti", but "Khreshchatyk" and "Zoloti Vorota" are in close vicinity as well.There is a useful public bus stop near the building. Perfect base to explore Kiev, so far as major tourists routs in the city start here on the central square. Beautiful historic park - Volodymyrska Hirka lays in 2-3 minutes walking, Sofiivska church - the same distance, Andriivskyi descent in 6-7 minutes. 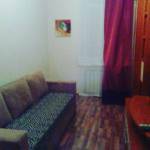 This location is perfect and safe place for accommodation in Kiev for all the reasons.Very central and very quiet. 3 Trokhsviatytelska and 2 Khreshchatyk are addresses in the same building, and this is the place where the central street of Kyiv - Kreshchaty begins. Here is a small round city square called Europeiska and the entrance to biggest picturesque city parks - Volodymyrska Hill. Kyiv's philharmonia and public library are on the other side of the street. Nearest Metro station - Maidan (Square of Independence) lays in 2-3 minutes walk.This area has a lot of restaurants, museums and sightseeing places. Major shopping center "Globus" is on Maidan. 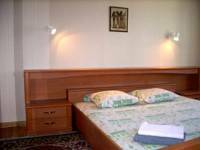 This location is one of the best possible accommodation places in Kyiv especially for guests. Apartment is located on the fifth floor of a beautiful nine-storey building with elevators, secure entrances, green courtyard and car parking places. Apartment comes with two separated rooms, one serves as bedroom, another as spacious living-room combined with kitchen. All windows are overlooking Europeyska square where Khreshchatyk street and Volodymyrska hill start. Full renovation in modern style has recently been conducted. Floors are covered with laminate and tiles. Each room has own air conditioning and LED TV set. Bedroom comes with king-size double-bed and huge wardrobe.Living-room has corner sofa which easily transforms to bed. Fully furnished kitchen allows cooking and serving meals. Amenities include fridge, microvawe, gas stove and all necessary glassware and kitchenware. Bathroom has jacuzzi and shower. Also independent water heater is installed in the apartment. This place is very quiet - quality windows do not allow street noise to permeate inside. Free and unlimited broadband internet access with WiFi router at your disposal as well. In general, this apartment is the perfect place for short-term accommodation or prolonged living of a single traveller, couples or families. All kitchen appliances for cooking, dishes, cookware, glassware, etc. Subway station in 3 minutes. Spacious apartment with all amenities. Quiet place almost at the Independence Square. This apartment is located on third floor of historical building with elevator, secure street-door and facade entrance. It has big french windows, tight curtains (jalousie) and a balcony, overlooking Sofievska street. It comes with two rooms: one bedroom with double-bed and living-room equipped with sofa and other furniture. Kitchen area is connected with living-room and has all necessary for cooking meals - gas stove, fridge, microwave oven and enable guests to choose to dine in or opt to enjoy an evening in the numerous restaurants downstairs. Floors are made of wooden parquet. Rooms have air conditioning and soft carpets. This apartment is comfortable, convenient serviced accommodation at an affordable price, 50% lower than in neighboring hotels. Also here is a broadband internet with WiFi router, LCD TVset with more than 100 international channels and CD music center. In general, this light, modern and spacious apartment offers a pleasant and inviting atmosphere where guests can relax at the heart of the Kiev downtown. Well equipped, well located and affordable, this apartment in Kiev is an ideal choice for your stay. Car parking is possible near the building. Sofievska street starts on Maydan (Independence square) and leads towards Sofievska square - historical place of Kiev with ancient Sofievska church built on 11th century. This place is both close to Metro "Independence Square" and "Zoloti Vorota". Set just steps from the central street Khreshchatyk and a short walk from Andriivsky descent or Volodymyrska Hirka park, this centrally located apartment is an excellent base from which to explore Kiev, with cafes, shops and supermarkets right on your doorsteps. Perfect place for single travellers or couples, for short term stays and prolonged accommodation. This apartment is located on 9 Kostelna street - it is a short street originating from Maidan and leads to Volodymyrska Hill Park - city park, one of the main landmarks of Kyiv and favorite walking and meeting place for inhabitants and guests. Maidan Square is visible from the apartment's balcony. This area is the best for tourists in Kiev with plenty of restaurants and bars. Embassy of Canada is located nearby as well. Nearest Metro stations - Maidan and Khreshchatyk are located just in 2-3 minutes walking. There is a supermarkets and shopping area under the Maidan, called "Globus center". Apartment is located on the 4th floor of beautiful historical building with elevators. Entrance from the street-side with secure door. The total space is above 70 square meters, ceilings are about 4 meters in height. The building has thick brick walls so it keeps constant temperature on winter or during the summer. Kostelna apartment has one living-room and one bedroom, separate kitchen and one bathroom. Also it has a big balcony. Its windows are overlooking Kostelna street and Maidan. We conducted the rehab in traditional style, restored wooden floors, and equipped this apartment with comfortable furniture and domestic technique. Apartment's floors are made of dark oak parquet and ceramic tiles on kitchen and bathroom. Another noticeable thing on this flat is original molding on the ceiling preserved during more than a century . The living-room has two sofas which can be transformed into beds, and bedroom with one king-size double-bed. In general there is enough sleeping places for 6 people. Each room has own air conditioning, there is wide-screen LED TV set on living-room and all necessary equipment in kitchen for comfortable accommodation. Also apartment has a washer. Fully furnished kitchen allows cooking and serving meals. Amenities include fridge, microwave, gas stove, big dining table and all necessary glassware. Bathroom has iron bathtub. Also independent water heater is installed in this flat. Apartment is not noisy despite of its location on busy street and would be comfortable accommodation either for short rentals or prolonged stays. Cozy apartment in the center of Kiev. Near Guliver and Arena - entertaining and shopping centers, Khreshchatyk, Bessarabsky market.The highlight of the apartment is a large balcony-veranda. Subway station in -5 minutes.